It’s MKR season (My Kitchen Rules) and it doesn’t really matter if it’s about a week late here in NZ I still love it. What I love the most about these reality cooking shows, never mind the occasional angry outbursts they trigger in me, are the fabulous recipes. This year I have already recreated 3 dishes from MKR (none from NZ Masterchef yet) and this is one of them. 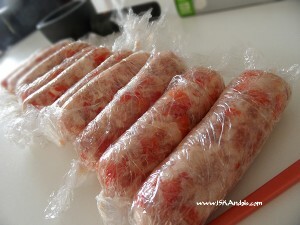 The Domestic Goddesses minced their own pork and used sausage casings to make their Homemade Italian Sausages. 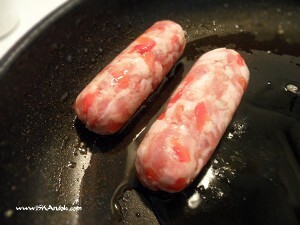 I bought fatty minced pork which I always do when making longganisa and make them skinless. Fabulous result! 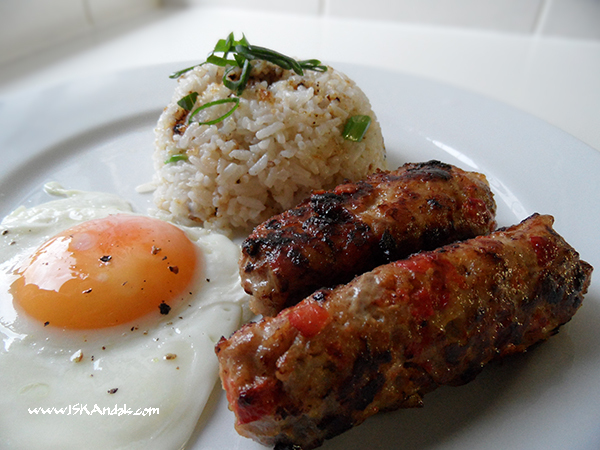 I served it ala-longsilog – with fried egg and fried rice. Oh, Joanna mentioned her coiled sausages looked like dog poo. Well… so do mine haha! Maybe the best option is to make them like patties (as suggested by a friend). Joanna was also very specific with the amount of salt she puts in. I just followed my guts. With sausages (and most other dishes) I normally add salt, mix, then smell. I kind of know when it’s the right amount with the salty smell. Preheat oven to 200 deg C. Line a baking tray with baking paper. Arrange capsicum on the tray and roast for 30 minutes. Transfer to a bowl and cover with plastic wrap for about 10 minutes. Peel and discard skin, then finely chop capsicums. Place all ingredients in a mixing bowl. Mix well all ingredients using your hands. Place spoonfuls of mixture on a piece of plastic wrap. Roll firmly and tightly using a round chopstick. Refrigerate overnight to develop more flavor. When ready, heat few drops of oil in a frying pan. 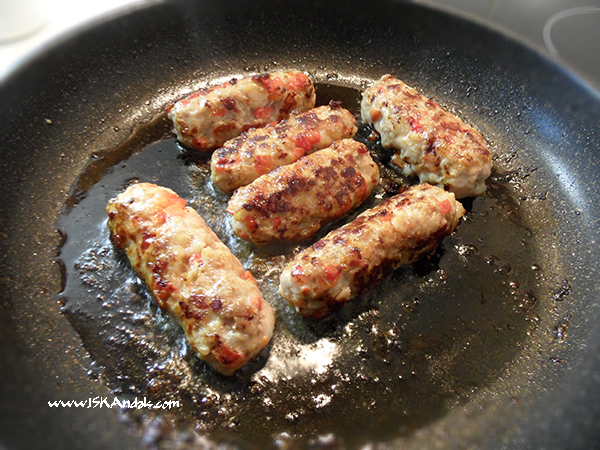 Fry sausages over low-medium heat, carefully turning occasionally, for about 20 minutes. 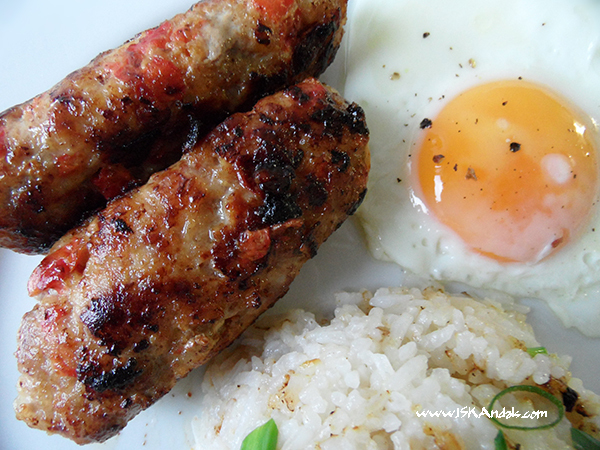 Serve with fried rice and sunny-side up eggs. I made 10 sausages - approx 1½ in diam x 4 in . 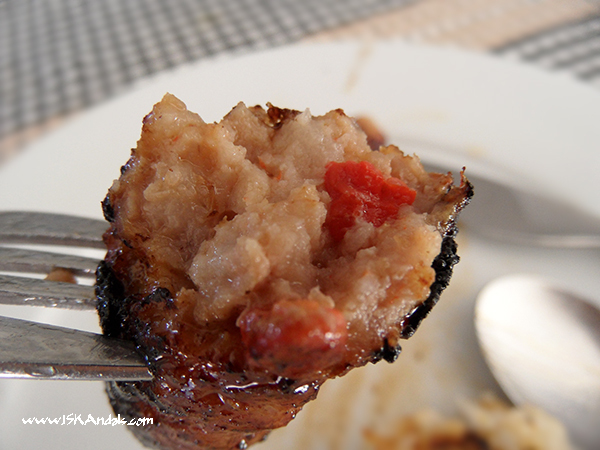 Fried rice is cooked using oil and juices from cooking the sausages. Suka?? 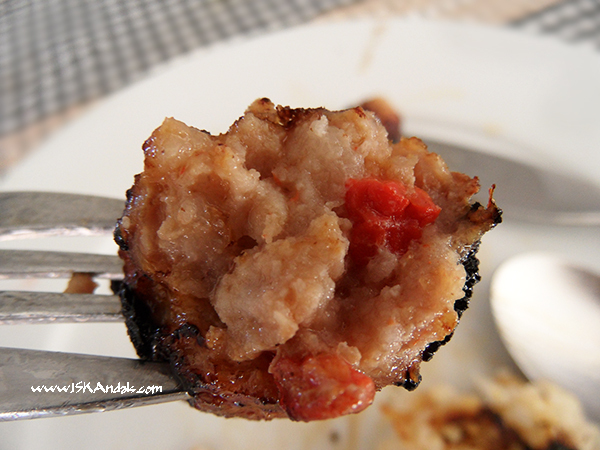 The bestest looking homemade sausages, Iska! They look like mini-me meatloaf. No suka in this one, Win Something different! Dexie, I’ve tried lean meat for sausages and they always end up too dry. I think at least 25% fat should be there. I have not eaten breakfast here yet right now. The two photos on top make me oh so hungry already! This is really great for breakfast! Making them as patties is also a nice idea. Man, this looks so good, perfect for breakfast…great post! oh, this looks goooooodddd! will definitely bookmark! I think I could eat this anytime of the day,not just for breakky.